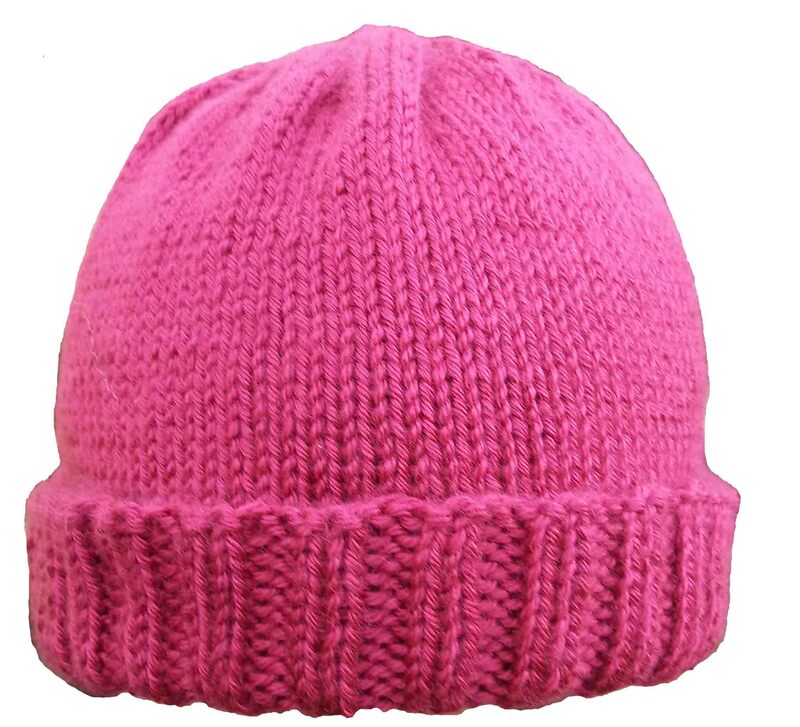 Hats are quick, easy knits – so much faster than scarves, and not much more difficult. Soon you’ll be churning out hats for all your loved ones. This basic pattern utilizes essential components of knitting – cast on, knit, and purl. Yarn: Any yarn, will work, but smoothish yarn is best i.e. not boucle or eyelash, etc. This is where a swatch will be important. Needles: Two sets of circular needles in an appropriate size for your yarn, or one circular needle and one set of double pointed needles of the same size. Cast on 20 stitches for your swatch and work until it measures 4” long. Bind off your swatch. Lay the piece flat and measure how wide it is in the middle. Next measure your recipients head. So, let’s say your swatch measures 4” wide; you figure out your gauge as follows: Divide the number of stitches cast on by the number of inches wide to determine the number of stitches per inch. 20 sts / 4” = 5 stitches per inch. Now, your head measures 21” around, so how many stitches do you need for a 21” hat? 21” x 5 stitches per inch = 105 stitches. 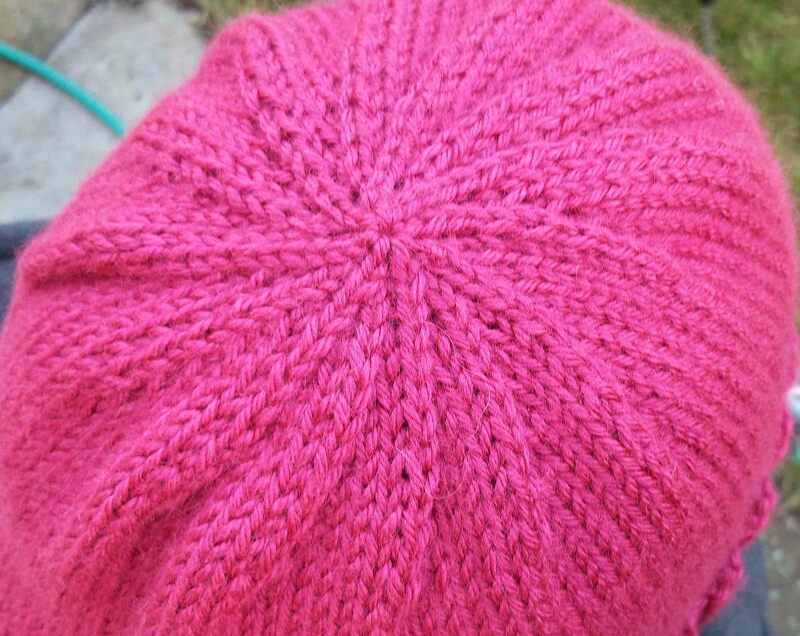 Since you need multiples of 4 stitches for your ribbing pattern you know you need to cast on 104 stitches to knit your 21” circumference hat. Loosely cast on the number stitches indicated by your gauge swatch, divisible by four. length as the distance from the base of the palm to the tip of the longest finger it is time to start decreasing. You see how the number of stitches between your decreases continues to decrease? You continue in this fashion until you have few enough stitches to cut the yarn and thread it through the stitches. Note: Switch to a second circular needle or DPNs when sts are too few to work with one needle. For a video on small diameter circular knitting working with DPNs or two circulars, visit www.knittinghelp.com. To finish weave in all ends. Thanks I needed this pattern. Also, great to meet you last night. I’ll see you next week. I’m so excited. We’re so glad you could join us!